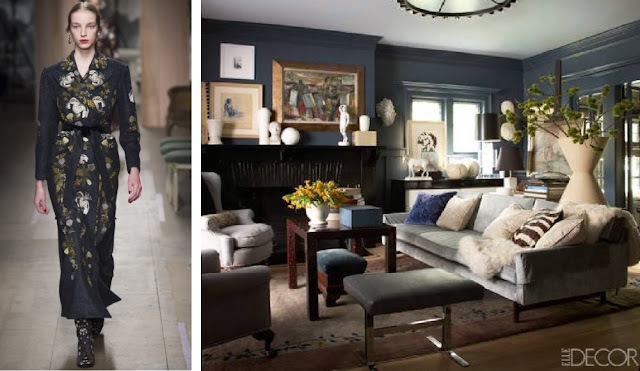 One look at Tobi Fairley's Portfolio, and it's no surprise why she was voted one of Traditional Home Magazines Top 20 Young Designers. 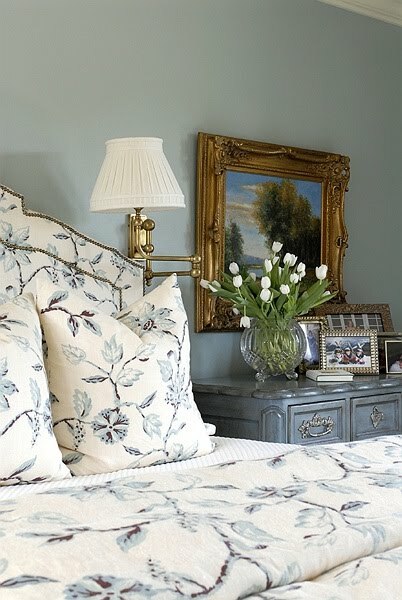 Her ability to create interiors that are rooted in Classic Design and enriched by colour and pattern is exceptional. 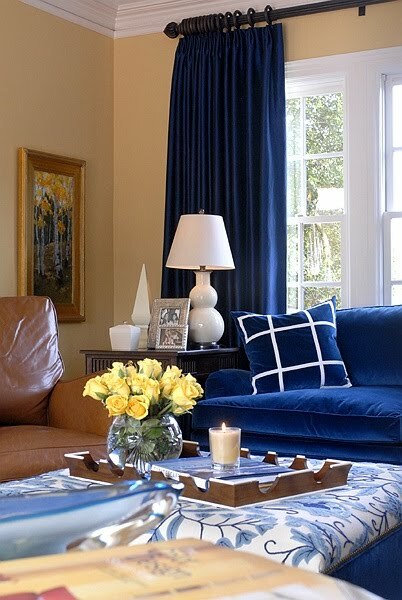 The wonderful weight of the Navy Blue in the drapery panels, sofa and bold dining chair is enhanced by the warm sun-kissed tone on the walls. 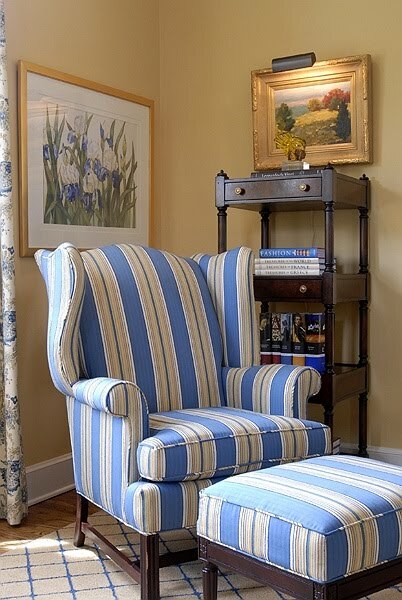 Adding the subtler blue pattern in the ottoman, occasional chair and area rug, create calm and allow us to enjoy the finer details of traditional design. 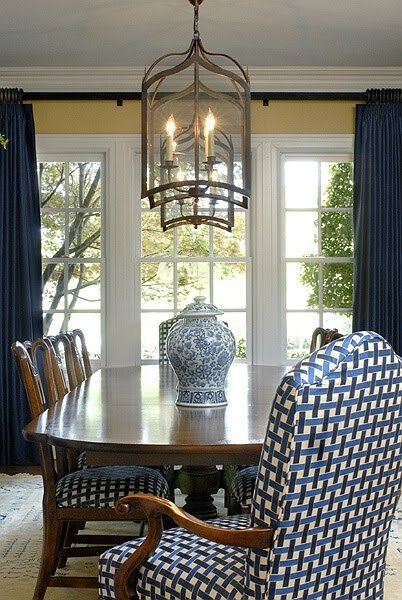 What fabulous light fixtures hanging over this dining table. The aren't your typical dining table lights, but they add a very rustic and informal feel to this room. 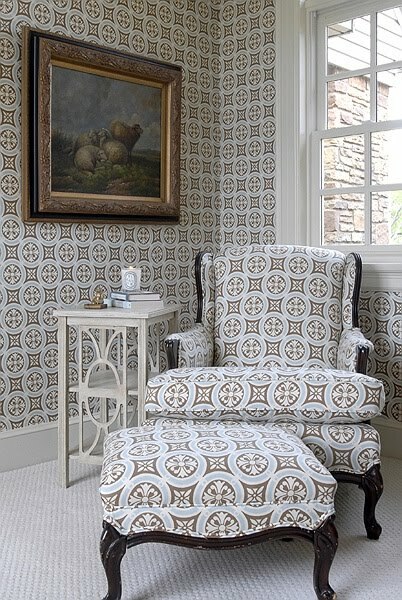 As does the fabric on these chairs. 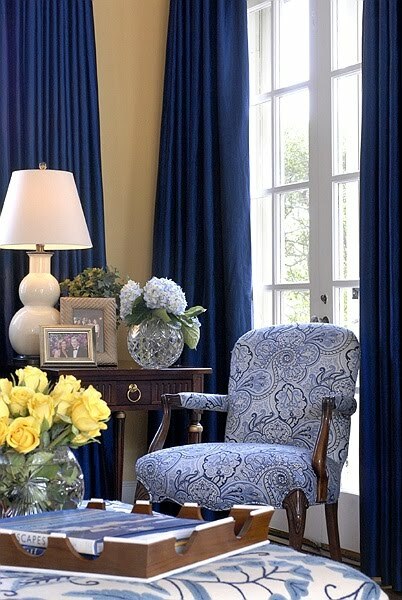 The bold blue and white weave has impact and adds to the relaxed setting. 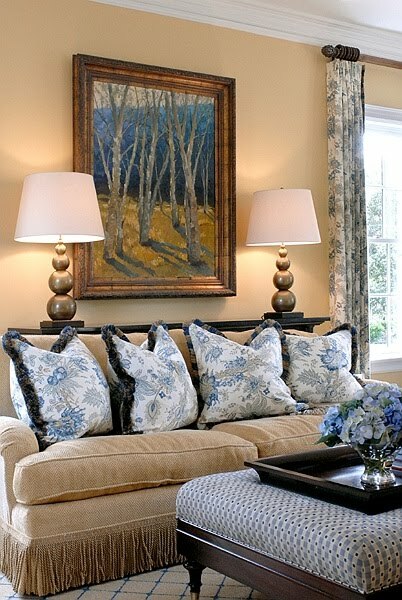 The artwork above looks like it could have inspired the entire palette for this home. 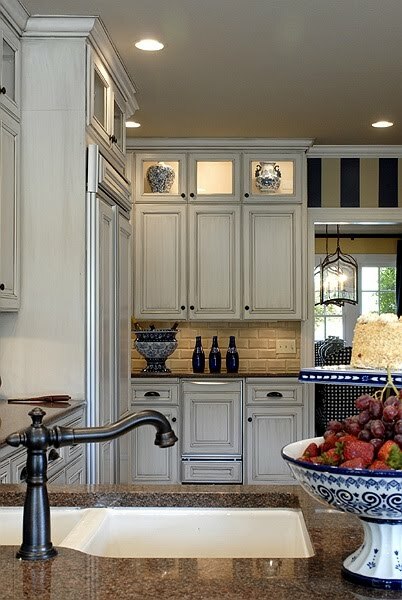 Just recently, Holly over at Things that inspire mentioned the great look of glass panel inserts in the hard to reach cabinets above the fridge. And here they are in all the upper cabinets, and a great place to display interesting objects. 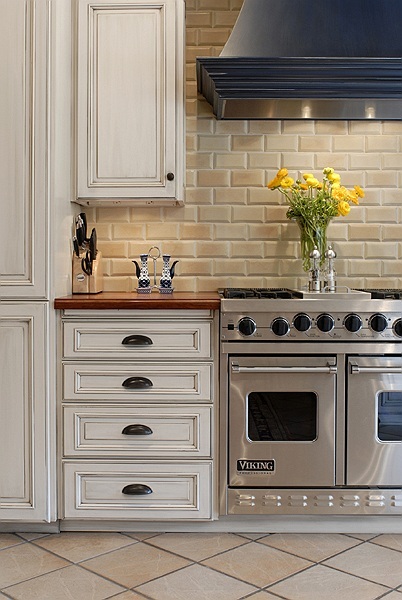 Cabinets have a little more depth to them because of their enhanced details, and keeping them light in colour keeps them fresh and updated. 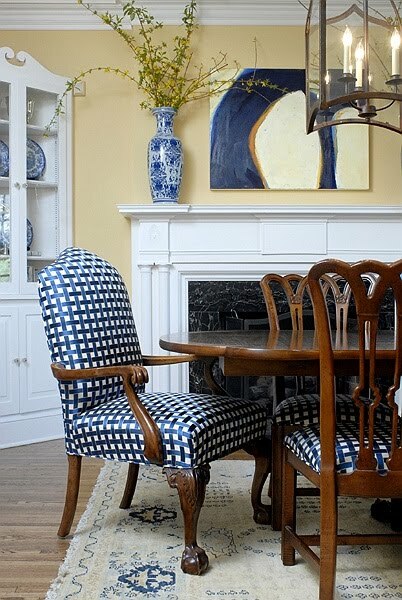 In the formal Dining room, the bold blue hits the floor and the pale tones embrace the room.. The lighting is again not typical over a dining table, but they are incredibly elegant. 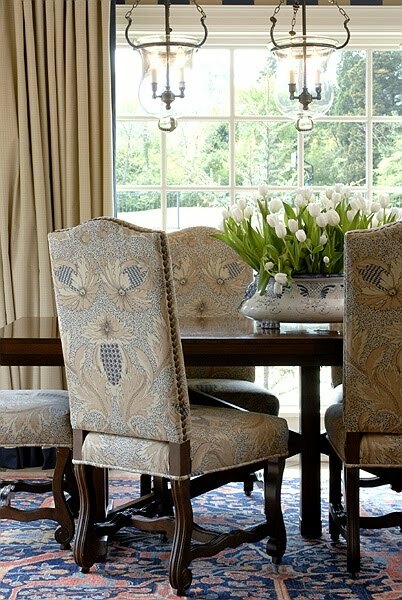 More fabulous fabric ( that I wish I had the name of) on the dining chairs play on the blue and beige theme throughout. If by any chance you are feeling like your traditional taste isn't in line with some of the pictures that have been gracing the pages of your favorite magazines lately. 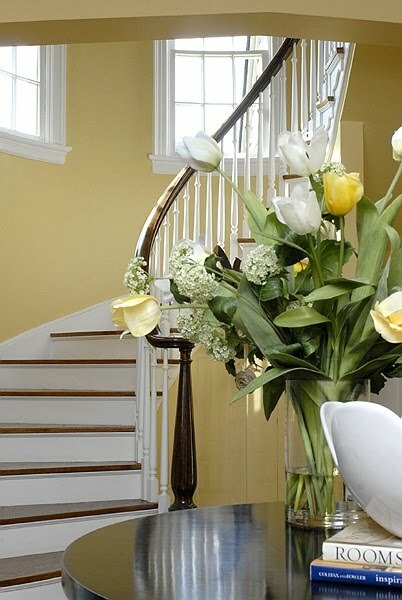 Fear not, traditional design is enduring, especially if you incorporate the right mix of current trends.